Let’s start with my annual winter ski vacation in Park City, Utah, where I had several blissful days of skiing powder on empty slopes. What follows is a painful ride down the mountain and another to the rather fab’ hospital in Park City (Thank YOU, US Olympic Skiing!) where the injury is diagnosed: Crushed Tibia Plateau. Surgery number one took place right away with a second I could look forward to when I returned home to Baltimore. A journey I never expected to take had begun. I have been fortunate to have little personal interaction with wheelchair disability. 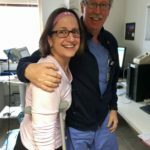 That all changed when I woke up from surgery number one with an orthopedic contraption called an External Fixator, or EX-Fix in hospital jargon. It looks more like something from medieval times than modern medicine. 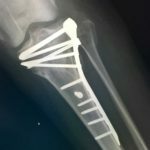 Its tinker toy-like exterior of bars pinned through my skin and bone to stabilize my leg until the second surgery could take place when the swelling subsided. While in the EX-Fix my leg was extended with no knee bend at all. A wheelchair with a leg support became my sole form of transport. Even after the second surgery to replace the EX-Fix with an internal “hardware store” I could put no weight on my leg at all. Walking would be out of the question for many weeks. As an architect, I thought I knew my ADA (Americans with Disabilities Act) requirements pretty well. As a wheelchair user, I was about to get schooled. Lesson number one: I have discovered that wheelchairs do not always fit in those spaces that I thought they were designed for. Take elevators, for example. I learned that many elevators require one to back in. Once I’d manage this feat, my leg was terrifyingly hanging out as the elevator doors began to close. Lesson number two: Those charming rough stone or brick entryways to approach a door? Impossible. Don’t even get me started. Lesson number three: Doors on closers are practically impossible. Installed so as not to have the door slam closed or fly open, the hardware at the top of the door means the door is always in the process of Slowly. Closing. On. You (and your crutches or wheelchair). You cannot open it and navigate through it. Just try it. Seriously. Perhaps the biggest lesson is that many building owners believe they do not need to accommodate the ADA. Many do not understand that the ADA is not a code, but a law, the requirements of which are decided by lawyers and judges. My building owner disagreed with my assessment of the requirement for an accessible restroom in his older building. Without an ADA-compliant restroom I could not get past the door and, even if I could, the stalls, the sinks and the accessories were entirely inaccessible to me. Because of this I’ve had to put off returning to work. Well, I’ll just have to be patient and wait until I can safely walk. So frustrating– and I am not by nature a patient person. But I can be patient and wait this out until I’m healed enough to get back to my regular routines. But it made me think…what do you do if the wheelchair is not a temporary part of your life but a permanent one? It is now mid May and it has been 14 weeks, three and a half months. Time, two excellent surgeons, lots of hardware and terrific physical therapists have allowed me to begin walking (though it will be a long, long journey to my old triathlon days). 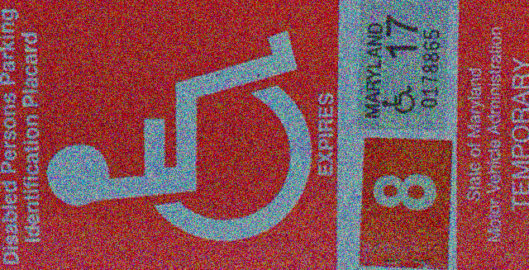 Regaining my mobility has not caused me to forget my new understanding of the frustrations that are faced by those who use a wheelchair on a daily basis—every bump in the sidewalk, every door on a closer, every older building that has not been made compliant with the ADA. For now, I am grateful to simply walk. But this newfound awareness? That is something that, as an architect, I can use for good. I’m glad to know you are on the mend and I whole heartily share your frustration with the building and the non-compliant building owner that turns a blind eye and deaf ear to the whole aspect of accessibility.